Start your day with our complimentary breakfast and stay connected with our free Wi-Fi. Enjoy a great sleep and shower experience to recharge yourself after. 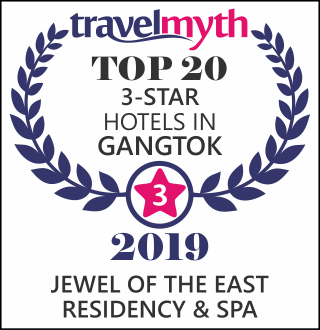 Jewel of The East Group brings to Gangtok two newly built four-star* boutique hotels located moments from the city's main attractions on MG Marg. The hotels offer premium facilities, amenities and convenient services with a fashionable twist and the very best of Sikkimese Hospitality. Located in the most happening area of Gangtok our guests get the best the city has to offer. Jewel Of The East Group offers excellent connectivity for you to explore the many sights of Gangtok. Major attractions like the Ropeway, the NamNang Sky-walk is located next to the hotel. Gangtok's newest star hotel provides luxury living in a contemporary setup. Enjoy elegance & comfort at its best during your stay with us. Designed with the requirements of the leisure & business travelers alike, our conveniently located hotel offers rooms featuring four-star ambience. Our guests will appreciate our comfortable & functional facilities, Travel Desk & great in-house dining options. Start your day with our complimentary breakfast & stay connected with our free Wi-Fi. Enjoy a great sleep & shower experience to recharge yourself after a long day. our sophisticated guestrooms are equipped with large screen TV's, Tea-Coffee makers & other modern amenities. Our hotels in Gangtok accommodates a luxury experience. Jewel Of The East Offers Great Tour Packages For All Destinations Across The North East. Choose From A Wide Variety Of Destinations Like, Darjeeling, Kalimpong, Pelling, Lachung. Jewel of the East Group operates & manages hotels & other hospitality assets across the key tourist & business destinations in India. With Jewel of the East we are creating a chain of value for money hotels offering high levels of luxury & star hotel experiences. Our hotel has a city center location which allows our guests to explore the many sights of the city with much ease. our Gangtok hotels are conveniently located in MG Marg area. Wreathed in clouds, Gangtok, the capital city of Sikkim is surrounded by mountains on all sides. Major attractions are Rumpek Monastery, The Namgyal Institute of Technology, Tashi View Point, Inchey Monastery, Tsongo lake, Baba Mandir & nathula Pass. We also have excellent dining options in our in-house restaurant and our bar. Our restaurant is open for all meals and serves a range of cuisines from Continental and Chinese to Indian dishes. Hotel Jewel of The East is a newly built four star boutique hotel in Gangtok that is located moments away from the city's main attractions. This luxury hotel in Gangtok offers premium facilities, amenities and convenient services with a fashionable twist and the very best of Sikkimese Hospitality. Jewel of The East Residency & Spa is hotel in Gangtok offers a choice of tastefully decorated rooms, all furnished in a modern style and equipped with numerous amenities for you, including Wi-Fi, tea & coffee making facilities, and heating. Our sophisticated guest rooms are equipped with large screen TVs, tea & coffee makers and other modern amenities. Jewel of The East provide a soothing and relaxing atmosphere and are the perfect home away from home.